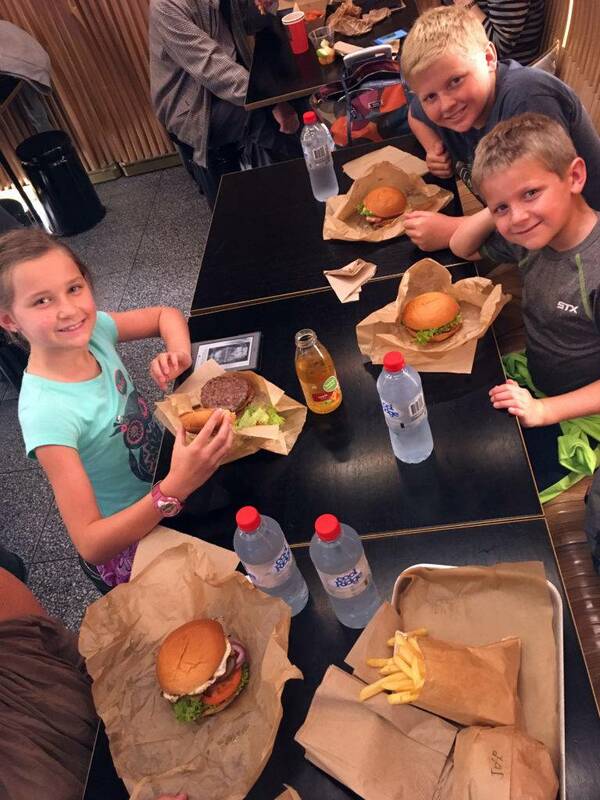 As we often travel with a family of 5 food costs in the airport can rack up quite quickly! To try to keep our costs as low as possible we utilize the benefits of lounge access that we get from our premium card; American Express Platinum. With the Amex Platinum card you can enroll for free in the Priority Pass program. Priority Pass is a network of lounges across the world of over 1000 lounges and expanding weekly! One of the newer perks with Priority Pass is that many of the new “lounges” are not actually lounges but restaurants. Basically you get a $28-$36 dollar credit (depending on the restaurant) to be used towards your bill. Even better you can sign in for 1 guest which gets you double that amount with out actually paying any money as it classified as a lounge visit..
Because we travel as a family of 5, I added my wife as an authorized card holder on my Amex account which allows her own priority pass membership. So for our family with 2 priority pass memberships we get the restaurant priority pass credit ($28-$36) multiplied by 4! We recently used this to have a pre trip lunch in Sydney, Australia and had a credit of $144AUD to spend. To make things even better there was a restaurant outside security in Sydney so we used our Priority Pass there for breakfast while we waited for the check in desk to open, then again past security at a restaurant for lunch before boarding. We saved over $200AUD in that day alone! A lunch from Better Burgers for FREE! The list grows weekly and I highly recommend downloading the app on your phone and keeping it up to date, you also can find lounges from their website. The list continues to expand so make sure you update your app or check online and enjoy! In order to keep our travel costs low we have to be forward thinking and planning to ensure we are getting the best prices possible on airline tickets. Knowing when to buy, recent fare changes, and fare trends can help keep the costs to a minimum. 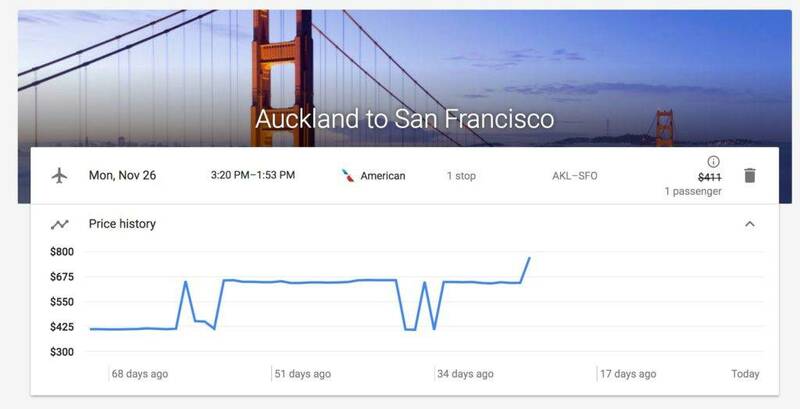 We have utilized Google Flight Alerts to great success as a powerful online flight tracker. 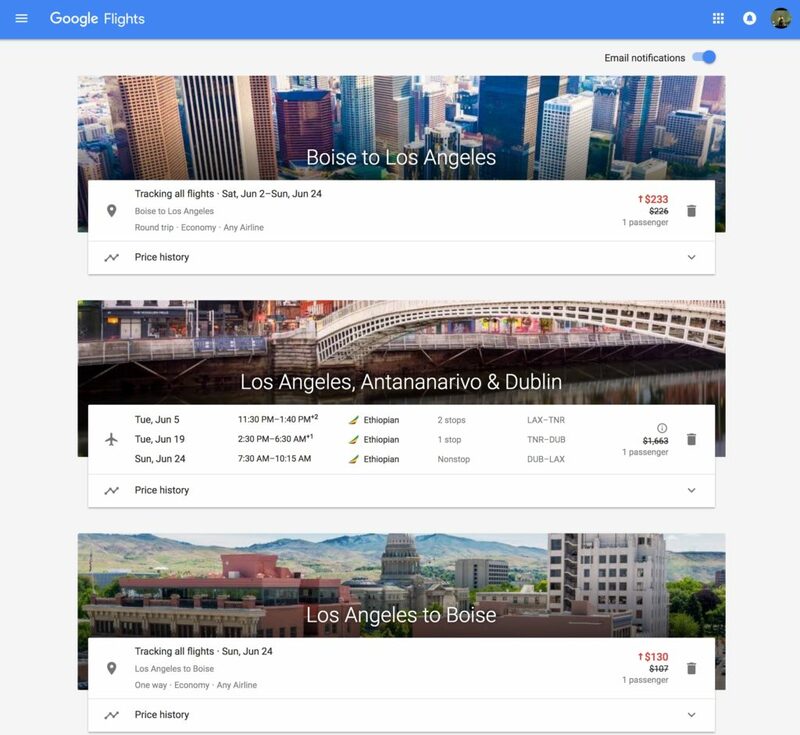 Enter Google Flight Alerts. You can easily track potential trips using Google’s powerful tool. You need to have a google account and make sure you are logged in. Start a search for a flight with dates you are interested in and click the track flights tool. Choose your flights then click the tracking tab near the bottom. Monitor and buy when you are confident. Another example is some flights I have been tracking for another client for a multi stage journey to Madagascar, then Dublin, then USA. This flight was much more unstable in prices and I was able to buy at what I knew was the best possible price. I have 40-50 flight alerts at any given time for future trips I would like to go on, trips I am tracking for clients, and dream trips that I could only afford if there is a mistake fare! 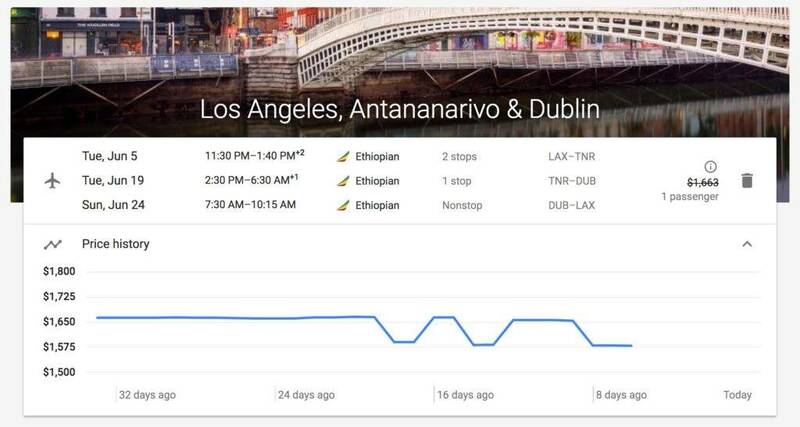 Keep in mind Google does not search ALL possible fares. Southwest is one of the major ones that will not show a price so double check your flights against Southwest before you buy. 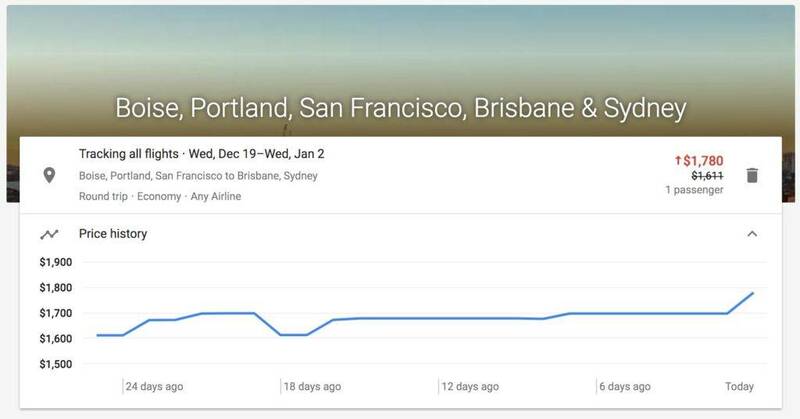 Have you used Google Flight Alert to score a great deal? How I saved $200 AND got 2 week free car rental! How I used AAVacations.com for a free car rental! Recently I began the process of price shopping for an upcoming trip to Europe for some kayak racing. Typically I can find flights from my home airport to most places in Europe for around $1200-1600 USD depending on the dates. 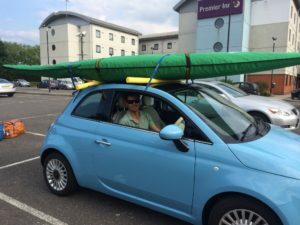 During my travels I have to rent a car as public transport is quite challenging with a 12 foot kayak to lug about. Barcelona typically has some of the cheapest per day rental cars in Europe and luckily BCN was my destination for this trip. After the initial salvo of searches I found a few flights on my preferred airline (American) and others (United and Delta) all at the $1450 range which I was happy with as I had little flexibility on the dates or timing of the trip. Before I finalized my booking I made a quick stop at AAvacations.com to see if I could save some extra money on my rental car by combining them. Using the exact same dates on the exact same flights I was able to find my same itinerary on American Airlines which included a rental car from Avis for $1240! Not only did I save over $200 I also got a free car rental! I wanted to see if this was something specific to my dates and city pairs so I tried a few other searches and was able to find more flights combos that get a free car rental. 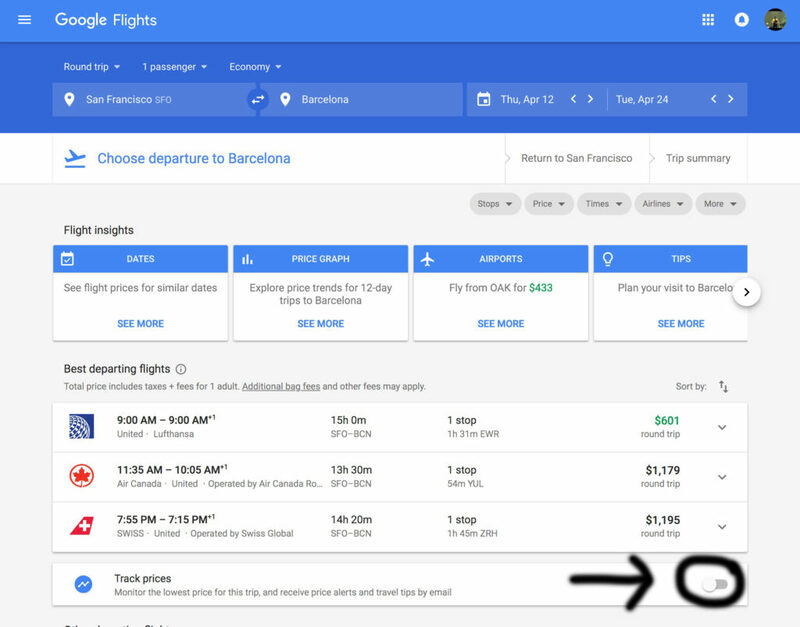 Google Flights – $1448 (there were cheaper flights but on discount carriers (WOW and Iceland Air) which I can’t fly because of my oversized luggage. On the average it seems save money depending on where you fly, it only takes a few minutes, and you can save quite a bit of money and get a free car rental! Want more? Follow us on Twitter or Facebook and keep up to date on the latest and greatest! So you finally saved the miles and found the perfect award booking with Delta Airlines. You are most of the way through the booking process and BAM you get an error code #100503A from Delta saying the award space is no longer available. You go back and search for the same itinerary and it still shows available online but you can not get the booking to go through. You are now in the Delta #100503A error zone! I recently found myself in the zone trying to book a one way from my home airport (BOI) to Barcelona (BCN). I found great award space in Delta One (their first class offering) that was connecting through Paris, France (CDG). In the booking process our flights were all on Delta planes (not a codeshare with another airline) except the last flight. The CDG-BCN flight was on a code share with Air France. I tried everything I could think of to get the transaction to go through. I used different web browsers, different computers, different IP addresses, everything I could think of and finally gave up. Next, I decided to try to book from BOI-CDG figuring that the codeshare portion of my journey was causing the problems with the actual booking. Then I planned to purchase a cheap one way flight from CDG to BCN (which was around $60 per ticket). With my new routing that was only on Delta planes I had no problem getting the booking to go through. It costs 70k in Delta miles and around $7 in taxes per passenger. However, before I went ahead and booked the separate ticket from CDG-BCN I had an idea. First, I found the original itinerary that I wanted from BOI-BCN for 70k miles and around $56 in taxes per passenger. Then because Delta allows free changes and cancellations within 24 hours of booking I contacted Delta on my new favorite platform; twitter. I tweeted @delta in a direct message, told them I had mistakenly booked to CDG and wanted to fly instead to BCN. I sent along the flight numbers and itinerary that I had looked up for 70k miles. Within about 5 minutes I was contacted back by the social media team telling me that they could accommodate my change without problem and all I needed to do was pay the difference in taxes. The social media team member then asked a contact number to call me to confirm my credit card info. A minute later I head a pleasant conversation with a very helpful woman who made the change and got me booked on the itinerary I wanted from the beginning! Ideally it would be easier to book a codeshare award with Delta but there is a work around that took me all of about 10 minutes to get done! This blog post is based from my personal experience, your experience could be different. I am not guaranteeing any success with this method but it worked for me! This is the second time for us that the Delta twitter team has saved the day! Checkout our other article on getting better award routing after a schedule change. Find the Family Frequent Flyer on twitter! Rental Car travel hack – finding a car when company is sold out! If you have ever been stuck making last minute arrangements for flights it can be incredibly frustrating, especially around holidays. Rentals cars can be even worse. Limited availability, holiday rushes, and high prices can keep you stuck at the airport or relying on public transportation for your surface travel needs. Use this rental car travel hack to find hidden availability! I have found on more than one occasion I am unable to find ANY rental availability for required dates to accommodate my travel needs. I search each carriers website, then search the broader websites (rentalcars.com ect), and even still I have been in situations (especially in Latin and South American countries) where there is NO cars available. Search better! Instead of using a US based search engine, or a multi agency search engine, I will use the search engine for the brand of rental car in the host country. A perfect example is in Chile. I needed to book a one way car rental and checked Hertz. I had to call in to request the car and 4 days later I was told nothing was available. Then I tried EuropCar (the only other rental agency that I could pick up in Santiago and return to an airport in southern Chile. Same problem with no cars available. Once I searched europcar.cl I was able to find exactly what I needed and it was actually cheaper than the price was typically listed on the US based sites. It did not require a Chilean license or passport. Luckily I can read Spanish, but Google translate could of taken care of that as well! So next time you can’t find a rental car use this rental car travel hack, check the local version of the site! Don’t get stuck up the creek with a big boat and a tiny car! Mistake fares can make your family travel money go further and help you travel to those exotic destinations across the globe! There is a lot of jargon that gets thrown around in the frequent flyer game and our goal as travelers is to utilize every tool available to us to get our family to the far flung places across the globe. One tool we have been able to use with great success is the concept known as a “mistake fare”. This is a hot button word and rarely do true “mistake fares” come around but if you have travel goals and don’t mind monitoring the internet you can use some low cost mistake fares to accomplish your goals. What is a mistake fare? Mistake fares come up for a very short period of time when the pricing algorithm gets an error and prices normally much more expensive flights for much cheaper. Most extreme mistake fares are cancelled as you are paying pennies on the dollar and per the Department of Transportation (DOT) US carriers do NOT have to honor obviously mismatched fares. But we have had some luck with higher cost mistake fares being honored. With any possible mistake fare you do not immediately want to make additional reservations for hotels, cars, ect until you feel confident your fare will not get cancelled (typically if they get cancelled it happens within a week). How do you find mistake fares? Luckily for all of us travelers there are plenty of websites out there who do most of the hard work for you. Our favorite hands down is Secret Flying. They have a great email subscription program which can send you flight alerts, and if you are a Facebook user you can like them and have their posts come up first on your feed. Other options include Fly4Free and AirfareWatchdog. In our family we have a standing list of places we want to travel that I am constantly searching for, if a mistake fare comes up for one of those we go ahead and try to book. Fares are often for travel within a few months of the posting so you need to be flexible and prepared to travel on alternate dates. Lastly, unless you live in hub cities (San Fransisco, LA, Seattle, Washington DC, Miami, Atlanta, New York, and Dallas) you will likely need to “position” to get your flights. That means you will need to travel to an alternate airport (one of the airports that has the mistake fare) from your home airport. For example, we fly out of Boise, ID (BOI). So we are always looking for flight departing from SEA and SFO as both of those cities we can easily drive to or fly on cheaper regional airlines. How do you confirm your mistake fares? So you found and booked your fare?! How long do you wait till you make additional travel accommodations? I always wait 2 weeks after I get a confirmation email with confirmed seats. After the two weeks I actually call into the airlines call center and ask for help changing seats and confirming my flight. If that all goes through with out a hitch then I have always felt confident enough to make additional travel reservations. One of the many AMAZING beaches of Australia. One of our greatest mistake fares came about last fall. We had been wanting to travel back to Australia because the family loved the place and it has a great slalom kayak course (site of the 2000 Olympic Games). Flight costs were quite high for a family of 5 and the cheapest we could find for the family was around $1800pp. During my coffee hour one morning I got my email alert from Secret Flying showing tickets from LAX-SYD-SFO for $370pp! Without even asking my wife I booked the entire family for a 7 week trip to SYD for the fall. I waited a week and called the airline to change seats and confirm my flights. They confirmed, moved our seats and we were good to go! Have you had a mistake fare for your family? Tell us below! Family travel hacks can take long haul international trips and make them shorter, easier, and get you home faster. We once took a flight from Chile, to Miami, to North Carolina, to California, to Sydney Australia. Look at that on a map and its a terrible idea. We recently booked an award trip to get us home from South Africa (JNB) on Delta airlines hoping to get the direct flight from Johannesburg (JNB) to Atlanta (ATL). Sadly when checked for award availability, the only flights possible for the cheap award fare were via Johannesburg (JNB) – London Heathrow (LHR) – Seattle (SEA) on Virgin Atlantic. 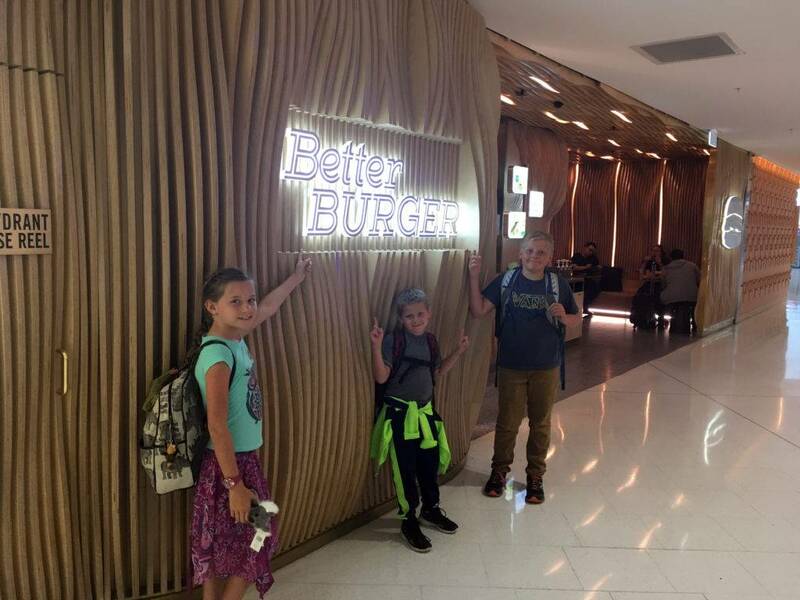 Having two overnight flights in a row can be a challenge for the kids, but the difference in award fare was substantial. It was 40k Delta miles per ticket to fly via LHR and 110k Delta miles to fly via ATL. To make matters more complicated there are no free seat assignments on Virgin Atlantic flights and to ensure we sat together we ended up spending over $600 to get preassigned seats on the flights. We always book our flights out as much as possible, in this case it was exactly 340 days before our trip. Because we booked so early between the time we booked the trip and flew there was a schedule change. Typically when there is a schedule change of more than 90 minutes you can take the option to change your ticket. Most of the time they will allow you to change departure times and sometimes even your route to accommodate your schedule. As soon as I realized we had a schedule change (the last leg of our flight home was 90 minutes later that we originally booked) on our flight I though of this family travel hack! The problem was; we figured it out while in South Africa and were unable to call Delta to get a change. Then we tried to change our flight using the web portal with no success. Without being able to call or change online I emailed them via the contact us page. Linzie then had the genius idea of contacting Delta via Twitter. 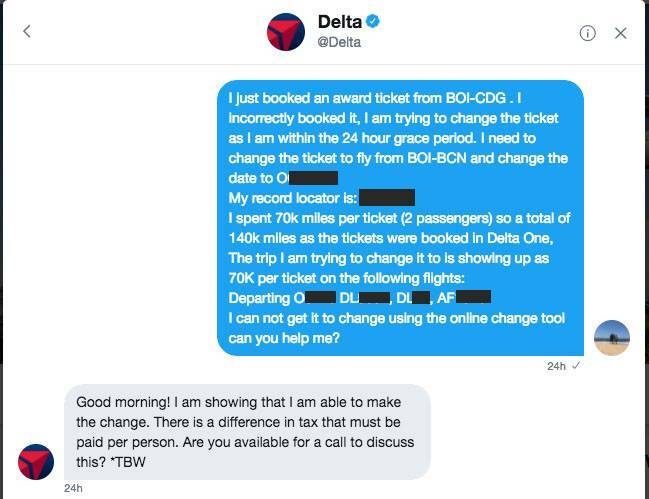 Sure enough within minutes someone from Delta responded on twitter. We began to direct message and I asked them if it was possible to reroute our tickets because the new itinerary did not work for our schedule. Family Travel for 5 to Africa! When you travel we should alway protect your credit card from fraudulent charges should always been on your mind. All to often when we travel we struggle with the conversion. Most of the time it is pretty straight forward but for whatever reason South African Rand conversions evades my ability to comprehend in math. Luckily there is a really easy workaround to at least give you a good idea what you are spending AND will alert you quickly if your credit card has been hacked and ran for fraudulent charges (or ran multiple times for the same charge). AmexBot and Facebook Messager making fraud protection and currency conversions easy! As of now the only credit card brand that I know that links this way is American Express. 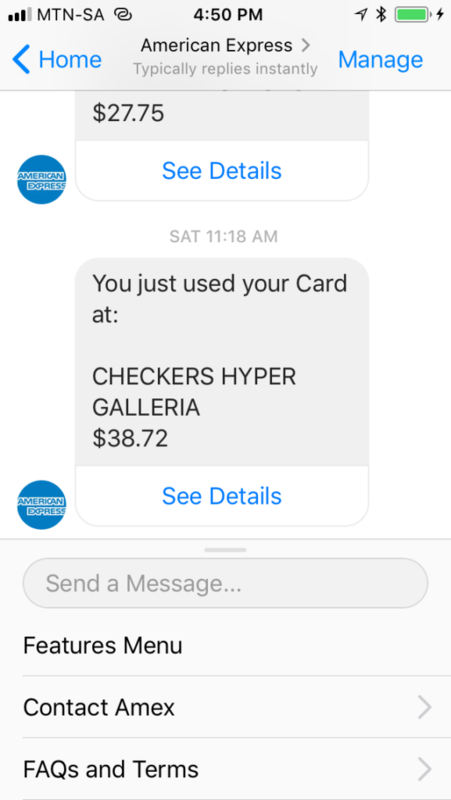 Link your amex account to your Facebook messenger account: Connect your Card to the Amex bot for Messenger by downloading the Messenger app on your mobile device and typing “AmericanExpressUS” into the search bar to locate the Amex bot. Then, select “Get Started” and log into your American Express online account. We always travel with data on one of our phones for the purpose of maps, and emergency contact. Using messenger keeps you from having to keep a SMS or MMS account active as it uses data. Whenever your Amex card is ran you will (typically within 10 seconds) get a message telling you how much you spend (in USD) and where. I have had a few anxious moments when a cashier has repeatedly swiped my card, or even worse, disappeared into the back with my card in tow. This way you know exactly what has been charged without any active participation from you and if there are fraudulent charges you can deal with them then and there. For us our Amex Platinum card has been irreplaceable as far as travel benefits and membership rewards. If your interested contact us and we can send you a referral for some extra signup bonus points!